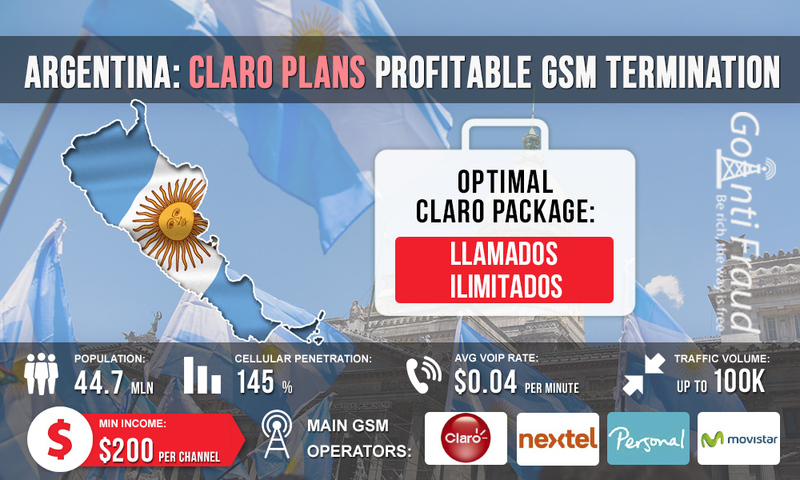 Claro is the leader in Argentina's cellular communications market, which has an excellent GSM coverage. The largest number of calls, including international calls, pass through this operator, so their SIM cards will be a wonderful choice for operations in the traffic termination field. However, to get the maximum profit, it is essential to use a profitable plan. One Claro’s SIM-card costs $0.25 to $1.25. In Argentina, starting plans are called ‘chips’ and are sold not only in cellular stores, but also in street kiosks, pharmacies, supermarkets and gas stations. To buy a card, one does not have to show his passport or another ID, which is beneficial for the terminators. Prepaid customers can use the Llamados Illimitados offer within the Prepago Plan, which is connected by default. To do this, you need to top up the balance with at least $1.26 and then you get the opportunity to make unlimited calls within Claro network. The validity period of unlimited package is 30 days from topping-up. With the voip gsm gateway tg200 running for 5 hours a day, you can earn at least $ 200 from each working channel with Llamados Illimitados plan. A minute of an outgoing call will cost you then only $0.004. As you can see, the prices for cellular communication in Argentina are excellent for earning money on termination. For effective performance in this area of telecommunication business, protect your SIM cards from both analytical and calling anti-fraud systems. Use the GoAntiFraud software service tools for this purpose.